The Ukulele has seen a massive increase in popularity in recent times; since 2006 the instrument has begun to replace the recorder as the instrument of choice for beginners in the school curriculum. Bands such as 21 Pilots, Canadian performer James Hill, and Hawaiian born performer Jake Shimabukuro have catapulted this small and relatively cheap instrument to the centre stage. The Ukulele is in its own right a very serious instrument, but is also a great introduction to guitar playing and because of its small size it is particularly suited to younger musicians and beginner students. At Guitar lessons Meath we provide both Graded and Non-Graded Ukulele lessons. Our graded Ukulele lessons are fully RGT accredited. 6 exam grades are currently available, ranging from Initial Stage (for beginners) up to Grade 4 (for intermediate level players). These officially-accredited and internationally – recognised Ukulele exams offer a formal recognition of the specific talents of ukulele players. The exam syllabus provides a solid foundation of musical education for any ukulele student and is designed to be accessible across different teaching and playing approaches. 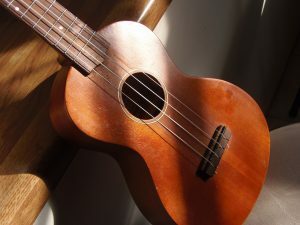 It is acknowledged that some ukulele players focus on the ukulele wholly in terms of its role as a chordal/rhythm playing instrument, while other ukulele players prefer to also explore the melody playing potential of the instrument. Consequently, the syllabus structure has been designed so that it can be utilised with equal success by candidates who are developing both melody and rhythm playing skills, as well as by those candidates who are focusing solely on chordal/rhythm playing techniques. This syllabus caters for Soprano (a.k.a ‘standard’), Concert and Tenor ukulele players that use standard G C E A tuning. Gain a useful and internationally – recognised qualification. Preparing for the exam will help you develop all aspects of your ukulele playing in a structured way. 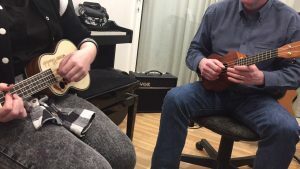 Our Non-Graded Ukulele lessons are by no means any less superior, much of the same curriculum is followed, but with much more flexibility to pursue a students particular field of interest. 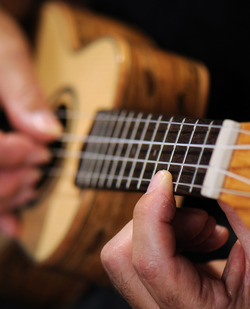 both our Graded and Non-graded ukulele lessons include in house assessments and regular tests of the course content. At Guitar Lessons Meath our main focus is the student and our ethos is to educate students to not only learn to play, but to understand what they play. As such music theory forms a large part of our lesson material. “Being able to play without a level of understanding of what you are playing; is very much like being able to speak without the ability to read or write” So our Ukulele Lessons are structured in such a way that as your playing ability improves so does your understanding and knowledge of what you are playing. Much of the skills and knowledge acquired with our Ukulele lessons are transferable to other instruments and form an excellent foundation no mater what musical journey life may unfold.